Opposite the Royal Mail Hotel on the Glenelg Highway at the foot of the Grampians (Gariwerd) Ranges. Specialities: Western Victorian History, Australiana, Australian Women Writers and Travellers, Oscar Wilde and His Circle. Opened in Dunkeld in 2004 after 21 years trading in new and old books in Hamilton. 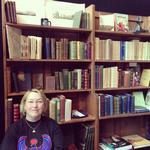 Carries a range of books of good quality sourced from local collections and at auction. Local history with an emphasis on small town booklets and ephemeral publications, general literature, botanical publications including Grampians material, postcards and travel brochures. Good section on the 1890's/Oscar Wilde and his Circle. Open weekends and by appointment. Catalogues issued, usually on Western Victorian History.